This battered chickpea recipe happened completely by accident. Or when the blender decided to erupt, exploding Green Monster lava all over the kitchen. Or those (many) times when I plugged in the electric mixer to discover it’s already turned on, shooting batter all over the place, as I scream for help. This processor is the second Kitchenaid 14-cup processor that I’ve murdered, slowly and painfully over time. Actually, I broke the first one trying to process dates on the first try. It takes a real skill to break a processor on the first go around! I’ve become so accustomed to this wonky processor, I don’t even bat an eyelash when it does weird things like ooze liquids. Eric walked into the kitchen the other day, looking with horror at the processor explosion. I tried to explain to him that this was “normal” and now he thinks I’m the crazy one. Why do I get the feeling that I’m getting a food processor for Valentine’s Day? With the food processor running, drop in the peeled garlic cloves through the top opening until minced. Scrape down the sides of the bowl, and add in the oil, lemon juice, and basil. Process until smooth, stopping to scrape down the bowl as needed. Add in the chickpeas and optional nutritional yeast. Process again until smooth. Add salt to taste and process. 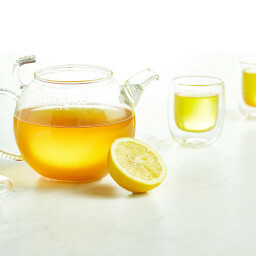 You can add a bit more oil or water to achieve your desired consistency. Scoop into a jar or air-tight container. Will keep in the fridge for 1 week or so. After making the pesto, I had some leftover chickpeas to use up, so I decided to lightly fry them in the skillet, adding seasonings as I went. This was my first time making fried chickpeas…and oh my lanta they are good!! Bored of plain chickpeas? 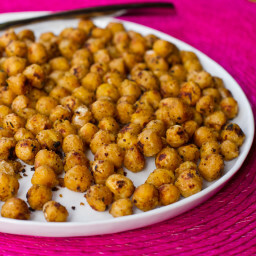 The nutritional yeast and seasonings give the chickpeas a thin coating and a ton of flavour, perfect for popping into your mouth. Keep in mind that the chickpeas don’t get crispy, but they do firm up a bit. I used garlic powder instead of fresh garlic in this recipe because the powder gives it more of a coating, like flour would. Add them to a salad, mix them up with chickpea pesto in a wrap, or just eat them plain. Note: You can also scale down the recipe depending on how many chickpeas you have to use up. Heat 1 tbsp oil in a medium-sized skillet over medium heat. Meanwhile, drain and rinse the chickpeas. When the skillet has pre-heated (chickpeas should sizzle on it), carefully add the drained chickpeas to the skillet. Be very careful as they will sizzle and crackle in the oil and it may splash you. Fry the chickpeas, stirring every 20 seconds or so, over medium heat. After a few minutes, stir in the rest of the ingredients to taste. The chickpeas will have a thin coating on them. Fry for about 5-6 more minutes, stirring frequently and making sure they don’t burn. If they are starting to burn, reduce heat. They should be golden and lightly charred in some parts. Enjoyed with the chickpea basil pesto, they did not last long! The 2012 Bloggies are going down right now until Feb 19th, with bloggers nominated in all kinds of categories. Oh She Glows is nominated in the “Health or Wellness” blog category (along with many of my fav bloggers, like Caitlin and Leo). If you’d like to check out the nominees and vote for your favs in each category, click here. There are a ton of fun categories (and blogs) to check out. Today, I’d love to make myself feel better by reading about your kitchen appliance disasters. Tell me all about it…I know I’m not alone! Hey Keri, I go back and forth with both methods too, depending on how much time I have available. If I have the time and plan ahead I make them from dried beans because it is much cheaper and probably healthier. I also buy BPA-free cans when I do buy them pre-cooked. I JUST soaked some chickpeas last night and I think I might start going between the 2 just like you said, depending on how time is. I recently started buying more dried beans, just to try and ‘make’ my own as a way to save a bit of money! Such a good idea…I need to start making beans in advance and freezing them like I was for a while! It’s easy to get out of the habit. I buy dried and can my own. It sounds like a lot, but it’s SUPER easy. All you need are some jars and a pressure canner. I take half a day every couple of months and can up a bunch of black beans, chickpeas and kidney beans and I have the best of both worlds. The convenience of canned with the cost and benefits of dried. I had never thought of freezing beans after cooking them. I take it you can do this? What a great idea! I’m sorry to hear about your food processor, Angela. Food processors and blenders are always the worst because it means you not only lose your wonderful creation, but that creation ends up on ever surface within five feet of the disaster. Thanks twice. Once for your thoughts on beans, and once for excusing my glaring spelling error. Here, hear. Ugh! Do you own a pressure cooker? 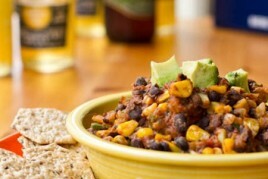 I only buy eden organic dried beans now and cook them in minutes in a pressure cooker! Saves a ton of time and money. Also pressure cooked chickpeas taste so much better than canned. how many cups of beans can you cook at a time? I just bought a pressure cooker but have not used it yet. I have a 6 quart presto stainless steel pressure cooker. I have cooked up to 3 cups of dried beans and I am sure you could do more. I also cook lentil soup in 5 minutes! 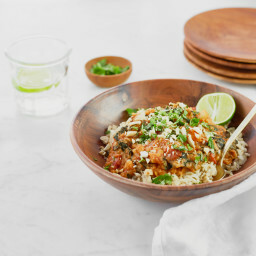 It is so fast you could make black beans, garbanzo and lentils in an hour! (all in separate batches). I would love to get a pressure cooker, at some point. My dad swears by one. It seriously never leaves the dry rack because I use almost every single day! The soups that it makes are soooo flavorful and so quick! Mine is a presto 6 quart stainless steel that I ordered from amazon for $40. I use it more than my food processor and vita mix! There is a great video on you tube that shows you how to use one. Looks like I’ve got lunch! Thanks, Angela :) . Can’t say I’ve ever had an appliance explode but I do short out the kitchen circuits all the time and think my gadgets are broken so then I run around plugging them in the hallway :) I need a high quality food processor as well. I was thinking the Ninja brand? I’ll have to check back in the comments as well. Oh my gosh, this looks AMAZING! I’ve just been thinking of what I want to do with a bag of dried chickpeas that a friend gave me and now I know: chickpea burgers and that delicious looking chickpea basil pesto to top them off with! Thanks. I’ve burned out a pair of beaters before. Before I got my KitchenAid stand mixer (which happened as a result of the mixers situation :D). I knew they were on their last leg because whenever I’d use them, there was definitely something loose inside, shaking around…Until one day they started steaming. 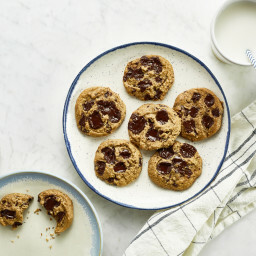 I was more upset about the fact that I couldn’t finish making my recipe, which was of course, your chocolate chip cookies! haha But, now that I have the standmixer, cookies for everyone, every week! who knew appliances could be so dangerous, right? Glad you got your stand mixer! LOL I’ve totally had the green monster lava erupt in my kitchen too! I’ve got a Cuisinart food processor/blender combo and although I can’t remember the model right now, I can definitely get it to you soon! It’s great and I’ve had absolutely no problems (knock on wood!) Another kitchen disaster was the time I singed all the hairs on my arm off when I lived in Bahrain. The flame on our gas stove had gone out, and my mum told me to just “carefully reach in and relight it”. I figured I’d be fine because after all, it was my mum telling me to do this. A few seconds later, BOOM! Hairs were gone, eyebrow was gone, and my mum felt terrible!! That would be traumatizing. Glad u are ok Ange! I can’t wait to make that pesto! I got my first food processor this year after being a vegetarian for 15 years. It is a cuisinart and I cannot believe I used to live without one!! Love your blog! Totally gonna make that pesto. YUM! This wasn’t an appliance disaster, but it was a major kitchen disaster: years ago, I had unscrewed the cap of my soy milk and lightly placed it back on the nozzle while I went to do something else. I forgot that I hadn’t screwed it back on, and proceeded to shake the carton of soy milk, flinging the stuff on every surface of the kitchen. Yay, morning celebration! I just got a 14 cup Cuisinart Elite Food Processor and I’m seriously in love. Having only had a mini/blender combo one before this thing is life changing. No accidents/explosions/or breaking yet! Thanks Gina, I’ve heard great things about Cuisinart processors! I made the mistake of buying the 7 cup version as I live alone trust me it is not big enough at times but it works great. Check out Caynes appliances, I did a lot of price checking and they often have the best deals. I love Caynes, thanks for reminding me! I haven’t been in ages. 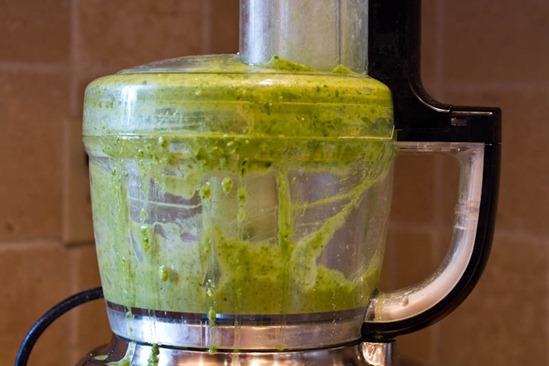 I only recently started making green smoothies and other beverages in my blender that I got for my wedding (7 years ago) – so it hadn’t gotten much use up until a few months ago. After about a month of smoothie making it started to smell a little like melting plastic. I ignored it because it was still making my smoothies. Then one fateful morning I started blending and it caught on fire. It was a spectacular mess – I couldn’t help but laugh, but only because I didn’t burn my house down :) Needless to say I had to go blender shopping that night! One time my food processor exploded as I was blending a super hot batch of broccoli-daiy soup. I had red hands for a few days, but for months afterwards I would find tiny specks of broccoli in the oddest places. I accidentally sacrificed a wooden spoon to my stand mixer :( Oopsies Thanks for all the different chick pea recipes! I keep buying more and more cans because of you ;-) Too many recipes, so few days! Yikes– no good with the food processor!! But the chickpeas look absolutely delicious! Have you tried roasting the chickpeas? You can get them really crunchy in the oven! I was also wondering if you can mention when the first newsletter goes out on the blog, I signed up but I’m not sure it went through. My biggest disaster is not exactly appliance related… I made a big batch of delicious herb dressing in my bullet and some how I managed to knock the container over. The bright green dressing got all over the counter, cupboards, floor and even managed to get on the ceiling! I was also drenched in green and I didn’t really know what to do with myself so I called for help. I also love roasting chickpeas, but I loved how quick and tasty they turned out in the skillet. It’s a good option for a “must have it now” snack. Love the look of those chickpeas! My worst kitchen disaster was opening a can of vegi broth to make a soup. The electric can opener didn’t turn off after the lid came off and the entire can of broth went allllll over the kitchen; in between cabinets, under the fridge, in drawers. NOT FUN! oh man that happens to me so much! I always put the microwave timer on instead of the oven timer (because it’s annoying to use) and then I leave the room, only to no hear when the timer goes off. A couple of times it was a good hour before I realized I was cooking something! This looks delicious! The shot of the food processor has me a little scared, though. :D I don’t want a big pesto explosion! That is a link to A Cuisinart 14 Cup food processor – I have had one for 6 years now and just love it. Cannot wait for you cookbook. I just realized they have it in HOT PINK! I have a 14-cup Magimix that works like a champ but a) only has one speed setting (for a $400 food processor!) and has a million parts that need cleaning every time, which is annoying. However, when it chops carrots and onions into nice, uniform pieces for me so I can make a soup I somehow forgive all its flaws. ps. I always bake my chickpeas but these look just as yummy and fast! 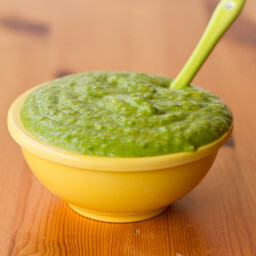 Ypur pesto recipes are soooo good!! I love the high protein one you made last! Can’t wait to try this one out!!! I just have to say.. DON’T eat two cans of chickpeas in any form in one sitting. It’s just not pretty. I was making sunflower seed pate and it wasn’t until after I had sampled some of it and was cleaning up afterwards that I noticed half the scraper was missing… I had scraped down the sides as it was blending and it must have caught the blade. Just goes to show you how sharp those things are because I didn’t feel it grab or anything! First of all, I just have to say how much I LOVE your blog! I’ve been a vegetarian for nearly three years, but I decided to go vegan as a New Year’s Resolution. Your recipe posts have definitely saved me from endless nights of eating salad for dinner. I can’t say I’ve ever had any explosive accidents in the kitchen, but I have burned pasta once. Okay, twice. Thankfully I’ve come a long way since then. That pesto looks great, what an awesome idea! As far as kitchen food processors go; I go hands down for cuisinart. I bought a Vitamix at Whole Foods when they were doing a roadshow . Love it! Use it every day and it is so easy to clean. No green lava explosions. I’ve killed six blenders in the 16.5 years I’ve been married. It’s usually right in the middle of making a smoothie that it happens. So sad! I just killed my crock pot last week. I had the heavy insert sitting on the back burner of my stove. I was cooking rice on the front burner (or so I thought). I walked away to help my son with a math problem and heard a huge pop from the kitchen. Yep turned on the wrong burner and cracked the insert. Ugh! 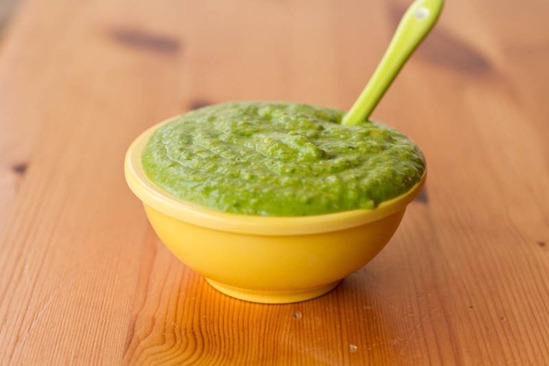 pesto hummus….. duh! How have I never seen this on the blogworld before it’s genius. My food processor is…. quirky also. I have a cuisineart and love it though! And green messes are somehow the worst!!! Haha, I hope you do get a new food processor next week! Dates should come with a food processor warning – I blew two 1-cup models and almost totalled my partner’s blender trying to make tasty Larabar-knockoffs! I’ve since learned to soak them for 30 min pre-processing and no more blenders were harmed in the making of delicious! Can’t wait for the cookbook – keep up the good work, Angela! Poor processor! That basil looks like it was worth it though. I’ve never fried chickpeas before – I do like them baked. I love how crispy/crunch they get! Will have to try out the frying method next. My worst kitchen appliance disaster… oh what a story. It was last year, I was in graduate school and had an exam that day…but I had woken up at 5:30 am with a horrific migraine. Obviously, I still had to take the exam, at this point it was lunch time, so I knew I had to eat something before I left for school to take the exam at 4:00 pm. I had taken medicine but I still felt pretty awful and all I wanted was a smoothie. So.. into my blender went a frozen banana, strawberries, soy milk and flaxseed. I hit blend, as usual. All of the sudden, I felt small things hitting me in the arm. I looked down and saw all these little black pieces of plastic on my arm. OH that’s because my blender was basically shredding itself on the inside and spewing tiny bits of black plastic all over the kitchen. I cried (seriously, I know) and ended up making my smoothie in the food processor. Desperate times call for desperate measures! I feel so bad for laughing at this, but damn that is funny!!! Not at the time, of course. Good grief, I can’t believe it ate itself. My poor food processor has definitely taken a beating too. When I first discovered how to make nut butters I went crazy making so many different kinds…. And it almost didn’t make it. On a better note, both these recipes look phenomenal! The pesto is kinda like a hummus-esque pesto. Love it! While this isn’t actually a kitchen APPLIANCE disaster, and it didn’t technically happen TO me, it might still make you feel better. :) When I was an undergrad I shared a townhouse with three other women, and one day, two of them decided to open up a bottle of red wine in the kitchen. Something went wrong with the wine bottle opener and the end result was red wine all over the cabinets, counter, floor, even the ceiling! Oops! That’s happened to me before too (the wine) and once I was using a wine opener and the cork fell INTO the wine bottle and of course we couldnt get it- or the tiny cork shards- out. That wasn’t a good drink! hahah wish I would have thought of that one! Not once, not twice, but THREE times my mom used her vitamix tamper without putting the lid on! She buys them 2 at a time now. oops this comment posted below for some reason. Anyways, I said –>Ouch!! I’ve heard that happening so many times, I’m actually surprised it hasn’t happened to me before.. I love when a so-called disaster turns into something fabulous. In this case=SUCCESS! I will for sure try these. I love this treat and that fact that you jazzed it up with your sauce. Amazing. Healthy too! Yes. I have one of those ceramic, solid surface range tops. You know the kind where you have to be careful when you’re done using it because the burner area is still hot but doesn’t look any different than the rest? Well, let’s just say the bottom of my blender learned that one the hard way. The base is half melted but still seems to work alright! ohhh that would be heartbreaking! I’ve melted many plastic baggies (from bulk food stuff) on my stovetop…and pots for that matter. I have a 9 cup Cuisinart food processor and so far I am very happy with it. Stick with a cuisinart it’s a classic, not the fancy ones, just the food processor. It’s almost as good as my vitamix blender. I’ve had mine for 10 yrs. no problems. I always blame my stove for everything! hows this for kitchen disaster: i moved in with my long term boyfriend for this past summer. he’s working on his masters in environmental engineering, and still lives in his fraternity house since its so much cheaper than an apartment anywhere else, plus its a 3 story mansion built in the 1800’s with more “character” than you can imagine. I love to cook, but I ESPECIALLY love to bake. the problem? the oven in his house is probably 60 years old.. to light it, you have to remove the bottom pan and light the pilot light by turning the gas all the way up, lighting a piece of paper using one of the stove burners, and reaching your arm to the back of the oven while working your magic with a sparker button which lights the pilot light… sounds fun right? thats just the beginning. the thermistor on the oven is broken, so it only has one setting: on, which is about 600 degrees. so you have to crack the oven door with a spatula and watch a thermometer inside to get the temperature right, and things tend to burn on the bottom and not cook on the top. so frustrating!! Now that we have a different place with a real oven I could not appreciate it more!!!! And he bought me an Oster 10 Cup Food Processor for my birthday and I absolutely love it, I’ve never had any problems with it and it also makes grating carrots and zucchini, or slicing veggies for stir fry a breeze! My food processor died today because I tried to make A LOT of almond butter at once. It was just too much for the poor thing and now my kitchen smells bad because of the smoke… :(. Well, this is surely a pleasant kitchen mistake!! Looks delicious!!! While not an appliance disaster per say, it was an epic mess. My mom baked an apple pie and when it was done in the oven put it one the back burner to cool. I guess the oven was still cooling and the pie got too hot (it was sitting on the back burner above the vent that helps the oven cool) and the apple pie EXPLODED all over the kitchen. Hot apple pie filling + pastry + broken glass everywhere! Lesson: beware of aging pyrex dishes. I attempted my first time to make homemade almond butter in my processor, after about 10 mins on and off it finally got really hot and smoked a little, not good. What is funny is I still use this same processor and it works just fine, must have overloaded the poor thing. Oooh, yum. Never thought of battering chickpeas but they look awesome. Gotta try that some time. If it makes you feel any better, I once used a hand mixer until it literally went up in smoke. It made a popping noise and then spewed smoke out the little vents in the sides. I still don’t really know how it happened. I should really invest in a better quality mixer, haha. I made date squares for the first time the other day, and thought I must be doing it wrong because the dates were so hard to process! I used the magic bullet… which ended up taking forever because I could only do a couple of dates at a time, but it worked really well. I also use it on soups, because my blender no longer works. If you’re doing small batches, the magic bullet is great. I tried to cook beets in the microwave once and horribly failed. =( They started on fire and I ended up destroying the microwave..and the homegrown beets!! I try to avoid microwave cooking by all means now. Looks delicious! As for a food processor… I don’t have one. I use my Vitamix for EVERYTHING. If it’s something really small I use the cup attachment on my immersion blender (or just chop by hand). I have a really small kitchen and the less appliances the better! I can’t wait to try out both of these recipes! I recently attempted to lighten up my pesto recipe and it didn’t have much flavor, so I’m excited to try yours. I never would have thought of adding chickpeas! When I was younger, maybe around 14 or so, my younger sister and I were home by ourselves and we had something heating up in the oven. Next thing I knew, there was a flame in the oven! It was an electric oven and part of the coil had caught on fire. Thinking I was being brave and responsible, I grabbed the fire extinguisher from the garage and sprayed the oven until the flame went out. However, I had NO idea what a mess a fire extinguisher makes. And whenever I think about it I can still taste the disgusting flavor I had in my mouth from breathing in those icky particles – so gross. To top it all off, my mom was mad at me for making such a mess! Not my finest hour. I LOVE my food processor and use it all the time. I have a Cuisinart Pro Custom 11 Food Processor (DLC-8S Series). My mom has had her Cuisinart food processor since she and my dad got married 30 years ago, so I think they’re pretty reliable! Good gracious, woman! It is like we are on the same level. I have all these chickpeas to use up and I had no idea what to do with them, since we are hummus’d out! While I have never busted a food processor (let us know what brand everyone is recommending, I need a new one! ), I go through blenders like they are not an expensive appliance! I burnt out the motor on two Breville’s because of my heavy on the beans and greens smoothies! I should just shell out the dough (ha ha, no pun intended!) on a VitaMix, I just cannot convinve my husband. Ha-ha I have done the exact thing! So making this! I just need to get some fresh basil stat! I ran out of nooch last night making juice pulp crackers NOOOOOOOOO!!!!!! I have to make these, oh they look so yummy and I’ve been on a huge salad kick lately so I bet they would be a great addition. 3000! Can you believe it. You are awesome, the community on your blog is awesome and I’m so happy for you. I’ve always enjoyed chickpeas. Fried chickpeas. Baked chickpeas. 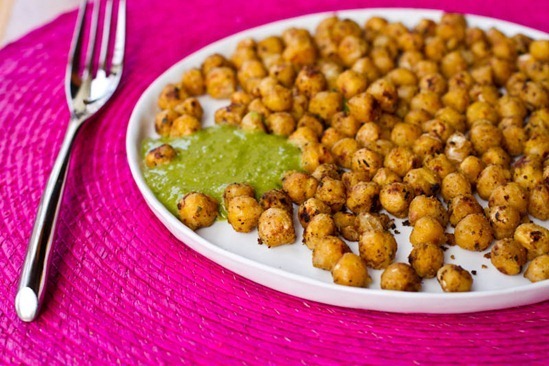 Curried chickpeas… you get the idea. But lately I’ve been really appreciating the intense and wonderful flavor of fresh basil. This would be perfect on top of a salad. Couldn’t see it lasting too long though. OH, Angela, don’t feel bad. I killed a food processor myself – not the first time, but within a month, so maybe 3rd time? 4th time? I guess when they say don’t overfill they mean DON’T overfill. I just kept pressing the buttons and told my then boyfriend that something happened. He came in, saw the thing filled to the top, and said “You killed it.” Bye bye food processor. I also killed a kitchenaid mixer. In my defense I think it was a defected model. I turned it on, worked fine, added some ingredients went to turn it on again…. dead. We promptly returned it and got a better one… she’s still kicking ::knock on wood:: for years now. 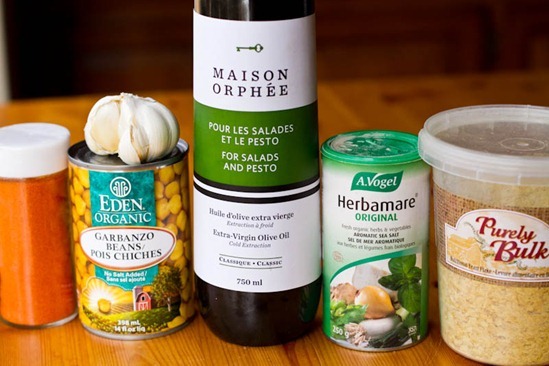 Love the addition of chickpeas to pesto…looks great! Thank you, I was just looking for a dairy-free pesto sauce to try out! I love the idea of cooking chickpeas this way too, never tried that! I’ve had my Cuisinart food processor for 14 years with absolutely no issues. I love KitchenAid for stand mixers and their excellent customer service, but with food processors, I’m a Cuisinart girl all the way! Wow what a fantastic recipe. Can’t wait to try on top of a salad. Ouch!! I’ve heard that happening so many times, I’m actually surprised it hasn’t happened to me before. ahhh! Kitchen appliance meltdowns are no fun! but thanks for reminding me of a funny incident! Not long after my fiance and I started our relationship, we were making brownies or cake together. I had one of those really cheap handheld mixers and while I was beating the batter, it started to smell kinda funky! (but I was really used to that smell b/c it always did that) And Greg goes, “uhhhh is this gonna explode? I think it’s breaking down” and I tell him, “nahhh no worries. It always does that and I’m used to it!” And right after I said that, it started smoking and made a “pfffff” noise and stopped working. I don’t know why but that was such a memorable and funny moment! :P But I might be the only one laughing right now hehe. Angela–you’re a genius, I’m going to try frying the chi-chi beans…I bet they are wonderfully crispy compared to baking. Congratulations on the book deal–well desevered, looking forward to your published book! 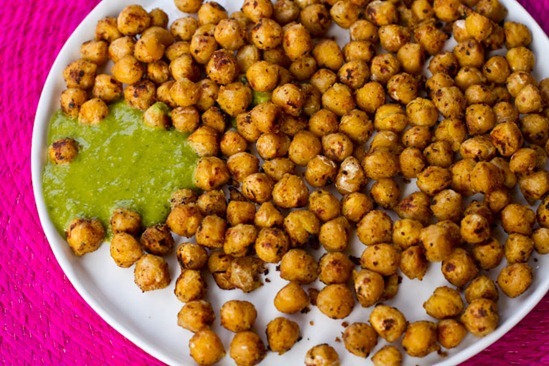 I love chickpeas – these look fab! The chickpea pesto recipe sounds yum! I haven’t had pesto in forever! “Green Monster lava” = hysterical! I’ve had two mid-price range ($150 – $200) Cuisinart food processors, and both have served me very well – no complaints! I have had too many kitchen disasters to identify, not necessarily involving appliances. My accidents tend to involve the spilling of large quantities of tiny grains and seeds, i.e. quinoa, chias, etc. Oh, and congrats on the nomination…going to check out now! Made these for lunch. Eating them right now in fact! Supper yummy!!! glad to hear that ashley! I fried a Cuisinart food processor/blender combo recently. I didn’t have the bottom on tight enough so the bottom was stripped. I bought a Kitchen Aid food processor to replace it. I love it! It came highly recommended and it was less than $100! Angela, I too have a Cuisinart and I love it–however I have noticed that food processors are not as good as blenders with liquids. I was just wondering if you have ever tried dehydrating chick peas before cooking. I love this idea of frying them, but I was hoping you would say that they got crispy. I want some on top of my salad right now. This is more of a housekeeping disaster than a kitchen disaster. My husband and I were living in a 1 bedroom apartment in Thailand. He had this battery with cables or wires attached to it that he charged in our bedroom. I don’t know much about that, but I plugged an iron into the outlet beside it. I started ironing, and soon I saw smoke and then fire. I started jumping around like Rumpelstiltskin screaming “FIRE! FIRE!,” shortly followed by “I didn’t do it -it’s not my fault!” Well, it turned out that the cord of the iron had caused the two battery cables to touch each other, and that’s what started the fire, so it was my fault. Oopsies! Luckily no one was hurt and we had a tile floor, so our home wasn’t damaged. 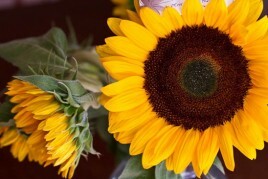 Hi am loving your blog and recipes! My recommendation for a food processor is a Thermomix! You can only buy them through consultants of which I am one but as I live in Australia I’m a bit far away to come and show you why they have the name of the smallest smartest kitchen in the world. 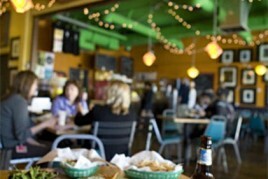 You would love them especially with the style of food you do there is nothing else on the market that compares. Check out their web site and have a demonstration you won’t regret it. I make everything in mine – almond milk, rice milk, mill grains and seeds into flour, nut butters, green smoothies, sorbet in 2 min, salads in seconds, dips and sauces and so much more. YUMMO! HOw very delicious indeed!!! Sorry to hear about your food processor curse! Those chickpeas look awesome. Bet they taste awesome too! 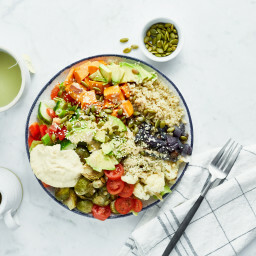 This looks so good can’t wait to try it! Have gotten a little tired of plain hummus . I soak 3 pds. of beans at a time and cook in slow cooker then freeze what I don’t need. It’s alot cheaper and I think they taste better. Thanks for your recipes and your web site you have really helped us so much . We make these in place of fries or potato chips all the time. I love making them spicy too. I have even “honey” roasted, they taste just like peanuts. YUM. Kitchen disaster – brand new food processor, first time using it. I emptied the contents of what I had just processed into a bowl and then put the plastic piece down on a hot stove. Thank goodness you can replace those. The smell of melted plastic was horrible. Those chickpeas look amazing! Can’t wait to try them. I forgot to tell you about my blender explosion ! I was making your wonderful vegan gravy [My whole family thinks it’s to die for] it started leaking from the bottom and I quickly shut it off but it just kept running and sparking and smoking , it looked like it was possessed ,I’m embarrassed to admit I actually ran away from it . My husband was laughing so hard he said my eyes looked like saucers , then he went in and unplugged the beast . Which had actually caught fire by this time. He now loves to tell the story of rescuing me from the demon possessed blender. It was really weird like something you see in a movie that looks kinda phony, totally strange ! I have a Cuisinart food processor that has 12-cup, 10-cup, and a 3-cup bowls. It also has 3 blades and two discs that go with it. I LOVE it. I use it almost every day. It’s very powerful — it has no problem with dates! My only complaint is that the gasket on the lid is difficult to clean. I saw this post this morning, and HAD to make these for lunch! The pesto & chickpea combo is delicious! I never would have thought to combine these, but I just ate the entire batch I made- oops. And now I am eating the pesto I have left by the spoonful! The best part about this is it is super quick to make! It only took me about 10 minutes :) Thanks Angela! Been there done that with the whole “plugging the mixer in without knowing it’s already turned on” action. ‘Flour bombed’ my kitchen a couple of times doing that. So for my food processor recommendation, I have the Cuisinart DFP-14BCN 14-Cup Food Processor in Brushed Stainless Steel. I purchased it on Amazon. Seriously this thing is an animal! So incredibly quiet, very sleek, easy to assemble, clean and operate. The power it unleashes is unvelieveable. I regularly make pestos, cinnamon date balls, yeast dough, banana soft serve, the list goes on and on. I LOVE THIS MACHINE! i can’t believe i have never tried fried chickpeas. i LOVE them baked, and this is much faster! I had a laugh reading your food processor troubles! My mom has had her black and decker food processor since her wedding day 20 years ago and its still going strong! It sounds like the world is breaking in two when I try to process dry dates but other than that it really can’t be beat. BTW, not sure if I am just waaaay behind the times and everyone already knows this, but I was ecstatic to learn the the blade from my broken blender fits onto a normal sized mason jar. So now I can make smoothies in a jar, using the blender base, and it doesn’t matter that the “jug” part of the blender is broken. Most helpful thing I have ever learned in the kitchen! And I apologize for not having a brand of food processor to recommend… I oftne find myself in the same situation, with liquid oozing out or things mysteriously stopping or starting, and for the most part I’ve resigned myself to believing that’s just the way it’s going to be. One of these days I’ll talk myself into getting a new one. I have an OLD 7 cup Cuisinart food processor. We have a bit of a love-hate relationship (I may have abused her a bit) – I use it at least once a day (sometimes 4-5 times) for some horrible and mean task. For the most part, she keeps on going… BUT… if I am processing anything that might get even a little liquid-y, I have to put a towel over her. This saves my walls from being splashed with all manner of messiness. I get frustrated each time I have to do it. Then I remind myself that I have had her for a LONG time (over 10 years – I really don’t remember not having her). My hubby munches up chick peas cooked this way, too (this is very out of character). I usually add a bunch of garam masala or chaat masala at the end – VERY yummy! I can’t wait to try adding a bit of nutritional yeast… why didn’t I think of that?? I don’t always get along with my food processor either. It’s a Moulinex – nothing fancy – I’ve had it for years and when I haven’t used it for a while I seem to forget how to put the pieces together to make it work! Then once I finally remember how to get it to turn on, it’s like the spinning action of the blade tightens everything and I can’t get the lid off. On more than one occasion I’ve been known to take my meat tenderizer mallet and bang away on the lid to pry it off. I keep hoping that in doing this I will break something and have an excuse to buy a new one but sadly that hasn’t happened yet. I’m also pretty good at burning out hand mixers – must have gone thru half a dozen in the last 10 years! is there something I can use instead of nutritional yeast? These look delicious! We need to buy a food processor, too. Someone bought it from our registry and sent it to us. Go figure! I adore chickpeas and this recipe looks delicious. I have had a few kitchen disasters…the worst was when I set the stove on fire when we were getting ready to move. There was stuff all over the kitchen, including a couple items on the stove. I turned on the wrong burner…I burned a whole baby monitor. Not good. There was soot all over the house a couple days before we had to turn it over to someone else. My new rule is to never never put anything on the stove that doesn’t belong there, even if I don’t plan to cook. Yum! These look delish! My food processor took a dump too! I ended up get a 16 cup Cuisnart that works wonderfully! I love it! Actually I love it so much I named him Zacj! Ithink I see him more then my Husband!! i killed my mom’s immersion blender by sticking it in a jar of almond butter, trying to blend in the oil that separated out. whoopsie! The first time I ever made icing with my KitchenAid mixer, I was adding icing sugar to the bowl and then accidental contact… The beater tapped the cup and in turn swooped white powder up and out – all over me and half the kitchen. I laughed like a crazy person. It was very “I Love Lucy” and took forever to clean up. The next morning, I opened an overhead cupboard and a mini fall of icing sugar fell to the counter. More cleaning. Lol. You can imagine that I am hyper aware when I make icing after that. 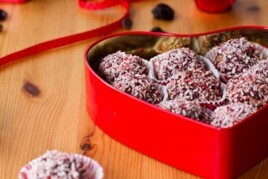 Btw, your chocolate cherry truffles? LOVELY. Made them last night to test run pre Valentine’s Day and they are spectacular. :) Thanks for the awesome recipe! lol I can just imagine the mess that would’ve made. Glad you like the truffles! Can’t wait to make those chickpeas..yum!!! Kitchen Disasters…too many to name them all. The time I burnt up my blender trying to use it as a food processor and pack it full of things that didn’t belong..the plastic melted. Whipping mashed sweet potatoes all over my kitchen when the mixer got out of control (or I had too much wine :). Burning my big pregnant belly on a hot cookie sheet sitting on my stove as I reached up for the microwave (how could I forget about the big belly)..3 years ago and I still have the scar! ArGH! Crispy chickpeas + salty pestos? Ohhhh lanta. I have a food processor that has been loved nearly to death. About two years ago I thought we’d have to bury it because the handle got off track and we had to crank it back into place. Who knew that batch after batch of apple slaw would stress it out. But it’s still kicking. Right now, there is a chunk of handle that flies off every once in awhile and stops it in its tracks. I hate to replace her, she’s still a little work horse. I also am VERY hard on crock pots. I shorted a plug out once and sent a shower of sparks that ate little holes in the crock pot when I put the insert on top of the cord that I didn’t realize was inside the metal housing. And one crockpot is without a knob and a handle. But, she still works, too. 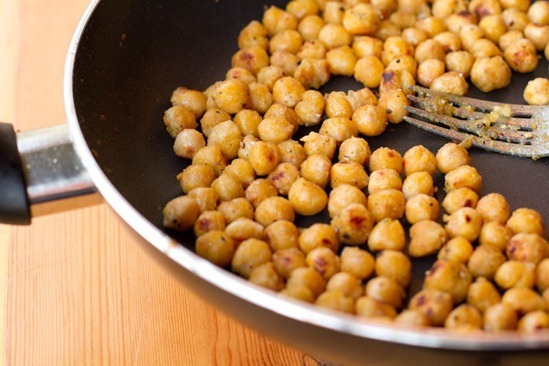 I have tried roasting chickpeas before but not frying them like this, they look so, so good! And so does the pesto! Yum major chickpea kick lately, this look like a fun take! I have a Giada De Laurentiis brand food processor from Target. I am pretty sure it was under $70 and I have had it for over a year – it works really well! It has good reviews on Amazon too. 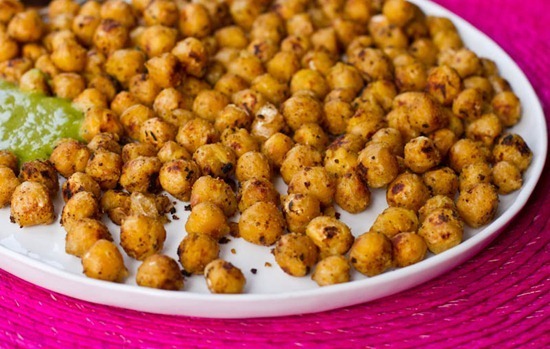 Holy crap, those chickpeas are so good! Angela, you are a genius! Thank you for all your recipes…if you have any suggestions on a good protein powder, would love to hear them. Can’t do whey. Any suggestions? I broke my food processor on the first try as well. I couldn’t believe it because it was so stupid. I scraped down the sides and left the spoon in when I went to pulse. Now the container and blade are stuck together. I have researched online and it seeks pretty common, with or without the spoon incident. I still use it. I just have to wash it all put together…which is tricky. It’s a kitchenaid 14 cup and I am sure I would live it even more if I could separate it. The battered fried chickpeas have become a stable in our house over last few months, thanks! Made the chickpeas for the second time this weekend and tried adding (mild, madras style) curry powder. Soooo good! EVERYONE loved them, including my meat-loving husband and two little girls. can’t anyone just comment about how the recipe turned out? Instead I read a lot of how good it looks, or it goes off on a tangent like this one about having smoothies blow up. I don’t have time to read thru them all, I am just looking to find out if people liked the recipe or not.